I have been on the verge of writing about trees on these pages for a long time, but it is not an easy subject bearing in mind our objective – to encourage amateur gardeners or even beginners. It is all very well to look up particular trees, name them by a Latin name and recommend them, only for you to find that your local garden centre doesn’t have them. So all I am going to suggest is that if you do decide to add a tree or two to your garden, you go along to the garden centre and browse among the rows of saplings that they have, looking at the labels to catch a sense of the size that that particular one will grow to. Tree size and garden size are all important when it comes to home gardening. Some of the traditional woodland trees can grow really big and really tall – the two don’t necessarily go together. For instance an oak may well grow to 40m height with a spread to match while a silver birch tends to be tall – 15-25m – but does not have a large spread. 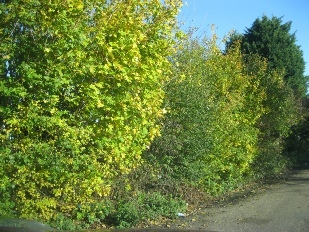 Those who want to sell you the infamous Leylandii – fastest growing and oft cause of disputes between neighbours – will talk about hedges rather than trees. The trees can grow tall and thick and be an ideal nesting place for birds, although not necessarily the birds you want to encourage in your garden. Because they grow so fast, within a few years you may have a tree beyond your management and require tree experts to take the top down. 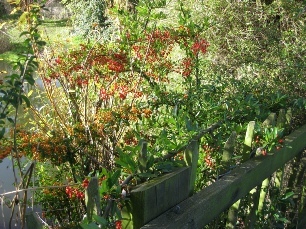 If you keep them to about 2m high, they do provide an excellent hedge and, yes, birds will nest in it. I have created a hedge and left individual trees to grow, the latter requiring some recent serious work on reducing if not completely removing them. If you want to know all about woodland trees – assuming you have a sufficiently large garden so you can plant a good distance away from your house to avoid root problems – your best bet is to use the Internet to see sizes etc. and where to grow them. Living in an area shared with an industrious squirrel means we have watched seedlings grow that turn out to be oaks and walnut in profusion. Potting them and passing them on to friends is only wise if you tell them how large they are likely to grow. Growing ornamental trees, which tend to be much smaller than the ones we have spoken of so far, is by far a better choice for the average small or relatively small garden (and new housing estates mean smaller and smaller gardens). Again the Internet or your local garden centre are the best places to get ideas. Ornamental trees tend to be much easier to prune and shape and keep to a manageable size. The other type of tree that might gain your interest is fruit trees. Again to avoid this becoming a large essay, Internet and the local garden centre are your next stopping off points. Be careful though because certain type of apple, pear, cherry, plum etc. can grow quite large and would dominate a small garden. However, the good news is that today there are two ways of overcoming that problem. The first is to buy a dwarf or mini-fruit tree (the tree not the fruit!) that can either be grown in a tub on a patio or in a small corner of the garden. The other approach is to buy espalier or ‘flat screen’ trees, probably apples or pears, which have been grown and trained to be flat shaped so that they can be grown against a wall and are, of course, particularly easy to harvest. If you are the beginner or amateur we are aiming for, you are in good company when it comes to trees. We planted one ornamental cherry with red leaves and it has flourished and is probably 7m high. 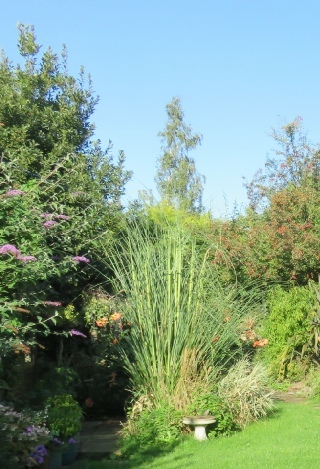 We planted three other ornamentals which, over a ten year period, refused to grow and eventually died and had to be removed. An aged diseased apple tree started to rot in the roots (to the dismay of the grown up children who had had a tree house in it years ago), a massive cooking-pear tree started to rot in the upper branches and had to be taken down at my wife’s insistence before I fell out of it when pruning it, another aged pear tree has just recently died (I suspect of disease and old age) and we have planted both an apple and a pear which have both successfully taken and bear much fruit. Win some, lose some, but if you do decide to invest in trees, a little investigation in the incredible Internet will help you spray trees, keep off disease and anguish! Some trees are thick and dense, and the birds make nests in them, others not at all dense and they simply roost in them. In the winter the evergreens still maintain their foliage and provide shape, while the others, having shed their leaves provide an amazing range of different skeletons. 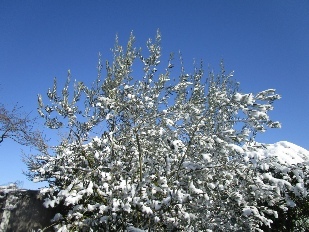 In the summer it is the different shaped and different colour leaves that give the trees their glory, but it is only in the winter that you can fully appreciate the different branch and twig structures. 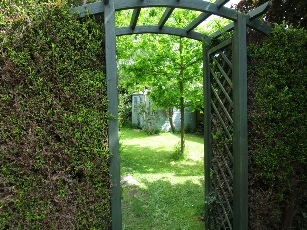 Perhaps more than anything else in the garden, it is the trees that provide character and shape and structure. OK, you’ve guessed, I’m a tree person; no I don’t hug them but I certainly appreciate the wonder of them. If you have a treeless garden, you don’t know what you are missing!